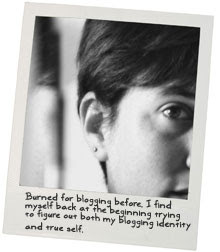 Today, believe it or not, is my blogging anniversary. My guess is, you have read the first post on this blog, as it is prominently linked to over in my profile. That post was written in September of 2008, so my four year anniversary of this blog is coming up. But prior to this blog, I blogged at a now defunct space that I visit every so often to see who I was back then. (Note: reading old posts is like looking at old pictures...I tend to critique everything and think how much better I am now than I was then...which tends to make me be self conscious of what I'm doing now considering that I'll look back on it someday with the same heavy-handed critiques). I started my first blog on August 11, 2005 and posted my first post at 2:59pm. So in honor of my SEVEN year blogging anniversary, I thought I would post my very first post from that blog, aptly named: Blog1. It isn't too exciting but it does show a bit of my voice. Huh...here I am...in Blog land. My guess is that my first blog is probably reminicent of most people's first blog. I have only really seen one person's blog...but it too started out with the starry-eyed, fresh-faced wonderment of the land of blogging. There really is so much possibility at the beginning. I almost want to take a moment of silence to drink it all in. Ok...well now that I'm done with that, I guess I should write something about my choice of blog name. I would like to point out that picking a blog name was very overwhelming. In the end, I just went with what came into my head first (and it is alliterative...which is always fun : ). Girl Gone Great is in reference to who I was and where I am now. Of course, things aren't always great now...but they are better than when I was a girl...so hence my name. I guess you could REALLY read into and say it represents where I have been, where I am now (only if you add a question mark to the end of it...like...Girl Gone Great?) and where I hope to go. So anyway, that is my name. I wish I could come up with some sort of grand, beautiful piece on what I plan on blogging about and how it is going to change the world as we know it...but sadly, all I have are an excuse to not do "real" work and a love a gabbing. But maybe someday I will have something to add to my blog that will touch lives in a meaningful way, and when that day comes, well...I most definatley will be unprepared for it as, along with my disdain for "real" work and my gossipy nature, I am also a severe procrastinator...but in any case...keep an eye out for that world changing piece I may post at some point. (See, don't you want to come back and check already?) In the meantime, welcome to my blog, thanks for visiting and have a lovely day! I love the idea of going back and reading the first post. It is a written history of not knowing the future. Sometimes people start a blog with a clear vision of where they want it to go, but a lot of times that first post is an introduction and a hope of what is to come. Because of this, I'd like to encourage you to participate in an experiment that I've never done here before: a link up. If you feel so inclined, use the link up feature below to link to your first post. I'd love to read it. I'll leave the link party up for a while so that people can continue to contribute to it. A lot of times people require a button share when they do a link party, but I'm not particularly into that type of thing. Just share amongst your friends if you so choose, and if not, you're still invited to the party :) Because even in the world of perpetual writing and growth, the beginning is still a very good place to start.